I now have the updated new LinkedIn profile layout. Over the past months, LinkedIn began rolling out the new design to members. The new look features bolder heading to divide sections and highlights recent activity. There are more graphics on the page including company logos and icons for each section of the profile. Only the first few recommendations are immediately visible. To see the rest, click on “See More.” Icons for each of the groups you belong to are now grouped in rows instead of one long column. With the new LinkedIn profile layout, you can include examples of your work with media links to a video, image, document or presentation. LinkedIn is gradually rolling out this ability to add media links to the Summary, Education and Experience sections. If you don’t see this option on your new LinkedIn profile layout be patient until the feature appears. Click Profile at the top of your homepage. Click Edit in the top section of your profile. Scroll down to the section where you want to add content and click the add media link (it looks like a square with a plus sign). Move your cursor over the link and you will see, “Add a link to a video, image, document, presentation…”. Type or paste the link to your content into the Add a link field that appears. A picture of your content will then display with pre-filled Title and Description fields.Note: It may take several seconds for this to happen. You can edit the content in these fields if you wish. The new LinkedIn profile layout is not compatible with Internet Explorer 7. Upgrade to Internet Explorer 8 to see the new features. New LinkedIn profile layout updated features. 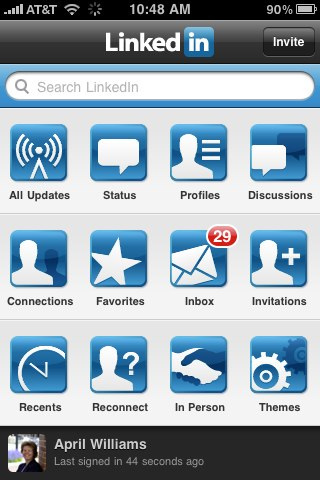 If do not have the new LinkedIn profile layout, sign up here: http://www.linkedin.com/profile/sample. Older adults are using social media sites despite the myth that they are offline. The Pew Research Center recently published these internet usage statistics by age. These statistics may surprise you. According to their research, 34% of adults over 65 years of age now use social networking sites. This is a dramatic rise from just 1% in 2006. Computer usage in schools led to high internet and social networking use among younger adults. It is less startling to see the highest social networking usage is for those between 18-29 years of age. As you can see from the Pew Research Center graph below, the social media adoption rate among older age groups is must steeper than for younger users. For businesses, these statistics are valuable for knowing how best to reach your target audience. Few of us have the time or energy to actively participate on every social networking site. We are more effective with our time by selecting social media sites which are most likely to reach our desired audience. For instance, there are almost twice as many men (63%) using LinkedIn as there are women (37%). Pinterest, a virtual bulletin board social networking site only two years old and already almost one fifth (19%) of women have accounts. Can your business ignore Facebook? The Pew Research Center says that 92% of adults use Facebook. With 100 million members, can you afford to miss out on the opportunity to reach so many people? What is luring older adults to the internet and social networking? The wish to connect with others. Grandparents want to see real-time photos and get updates on their grandchildren. We can share experiences with friends and family whether they are across town or on the other side of the globe. In a typical day, I interact online with friends in Japan, England, Hawaii, Florida, Texas, California and beyond. Click on comments and let us know which social networking sites you find are best for your business. Social media marketing is challenging for small businesses in McHenry County. Just keeping up with Facebook changes is almost a full-time job. Did you know there assistance for businesses in McHenry County and it will not cost you an arm and a leg?Bring your Facebook, LinkedIn, Google+, Pinterest, FourSquare, YouTube, Twitter questions and more. Check out the social media marketing programs offered at the Shah Center in McHenry just for small business owners. The Shah Center is a part of the Illinois Small Business Development Center. Social Media Roundtable: A no-cost seminar to discuss the latest trends in social media marketing and share various approaches with your peers. A social media professional will help facilitate the discussion and be available for questions. There is no fee to attend, reservations required as seating is limited. Social Media for Small Business: Do you have questions about social media? Want hands-on help? Bring your questions to our computer classroom and work with a social media expert. Learn new ways to reach and engage an online audience and boost your bottom line through the use technologies like Facebook, Twitter, LinkedIn and Google Plus. Cost: $30. All classes are held at the Shah Center. The McHenry County College Shah Center at 4100 W. Shamrock Lane in McHenry, near Centegra Hospital. For more information or to register, please contact the Illinois Small Business Development Center at (815) 455-6098 or sbdc at mchenry.edu. For information on all of CyberLife Tutors presentations, workshops, classes and events visit our events calendar. Is LinkedIn Better Than Facebook for Business Networking? Is LinkedIn Better Than Facebook for Business Networking? Will LinkedIn be replaced by the 800 pound gorilla? I do not think so. LinkedIn is still very relevant to the business community. Geoffrey James agrees in his article LinkedIn Will Outlive Facebook. Here’s Why. LinkedIn launched in 2003 and essentially has not changed much over the years. LinkedIn is not designed for multimedia with functions to store photos and videos. Basic resume information is all that is in a profile. My LinkedIn profile includes my professional credential and recommendations of my work. This is social proof and gives me credibility among peers and prospects. LinkedIn is the networking tools for professionals. In my many years in the corporate world, I know that contacts are researched on LinkedIn and a profile was expected. LinkedIn is still relevant for business to business and large companies. Free LinkedIn class for professionals at Algonquin Public Library. See how you can leverage those connections for your career. Learn how to leverage your LinkedIn network to discover the hidden job market and join groups to increase your chances of being found by recruiters. April M. Williams demonstrates how to make the most of your LinkedIn profile. This is a hands on session and computers are provided. Students must already have a profile and a minimum of five contacts. Class is at the Algonquin Area Public Library District main library located at, 2600 Harnish Dr, Algonquin, IL. Call the library 847.458.6060to register for more information. Seating is limited. LinkedIn is a professional networking tools used by millions of members throughout the world. The power of LinkedIn increases with the size of your network. Ask your friends and coworkers to join your LinkedIn network so you can stay in touch. I am often asked for suggestions when it comes to connecting with others. To ask another person to connect with you in LinkedIn, use the “Add Connections” feature under “Contacts.” LinkedIn creates a standard template email that most people use without a moments hesitation. They quickly click on the “Send” button without much thought. To improve your chances of a reply and to make a positive first impression, I recommend you take the time to customize your message to the receiver. I recommend including a sentence or two about how you know the person and why they may want to connect with you. This additional information will jog their memory and increase your acceptance rate. LinkedIn launched a “Follow” button for companies this week. When you are logged into LinkedIn, just click on the Follow button to follow companies of interest. This is useful for job seekers, sales people, vendors and networking. With over 2 million companies on LinkedIn this is bound to be a helpful feature for everyone. Click on the company Follow button to get updates on news, jobs or trends. Visit LinkedIn’s Developer website to build your LinkedIn company Follow button. Put your Follow button on your website or other webpages. Follow CyberLife Tutors on LinkedIn. A 100% complete LinkedIn profile attracts those with possibilities. Job leads, sales prospects or partnership situations are looking for you. Find out if your profile is 100% complete by looking on the right side of your LinkedIn “Edit Profile ” page. As you make updates, notice the change in your profile completeness score. The feature may provide you with additional profile completion tips. 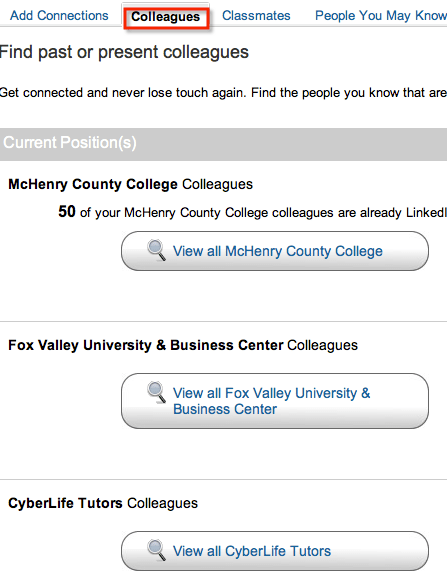 Learn more about how to use LinkedIn to “Expand Your Professional Network” 7PM Feb. 29, 2012 at the McHenry Library. For more details, visit our CyberLife Tutors events calendar. Keith Warrick, my friend and fellow LinkedIn evangelist, was interviewed on BDPA Blog Talk Radio about professional social networking. Keith was an early adopter of Linkedin, becoming a member well before I joined April 1, 2005. In the BDPA interview Keith pointed out the benefits of LinkedIn goes far beyond an online resume. So many people turn to LinkedIn when they are in career transition only. LinkedIn is a powerful tool which can promote your skills, demonstrate creditability and build relationship. Keith suggests fully completing your LinkedIn profile to gain the most benefit. LinkedIn will prompt you to create a 100% complete profile and coax you along to do so. Keith says just 2% of LinkedIn 150 million members have a 100% complete profile. As Keith says, imitation is the best form of flattery. Take a look at Keith’s or my profile for idea on how you can attract your target audience to find you through the LinkedIn search features. Click below to listen to Keith’s interview with BDPA. Are you on LinkedIn, have dozens of connections and thinking “Now what?” Wondering how to really used LinkedIn in your job search? Then this hands on class is for you. See how you can leverage your network to discover the hidden job market. Learn how joining groups can benefit your career. Find out how to increase your chances of being found by recruiters. April M Williams demonstrates how to make the most of your LinkedIn profile. Students must already have a LinkedIn profile and know how to add connections. These sessions held January 29 and February 5, 2012. A LinkedIn Basics class will be held January 15, 2012. The LinkedIn Advanced for Professionals class is one of the many career related services and programs offered by the Algonquin Library. Check April M. Williams and CyberLife Tutors calendar for the most current schedule of events. Connect with April M. Williams on LinkedIn.